The RED PEN OF DEATH comes out every year when we're working on one & two point perspective. I have them fold a 12x18 piece of paper in half so that they will have 4 surfaces to practice. I also let them know starting out that we're working on an exercise..and that it is not the finished work of art. This takes the pressure off, and they are able to enjoy the process...and the improvement they make during the 4 attempts. Love the "red pen of death"....what a good way to encourage practice without the pressure of a perfect end result! What grade levels do you teach this to? I've tried as early as fourth if they seem ready, or wait as long as seventh if I get busy with other things and don't get to it in an earlier grade. Any thoughts on an optimal time for understanding and success? 3rd grade for 1 point.....review in 4th...intro 2 point. It can still be a struggle for many...but like to expose theme to it with a no pressure atmosphere. Thanks for the input. I'll have to give it a whirl later this year, maybe with some of those younger students. 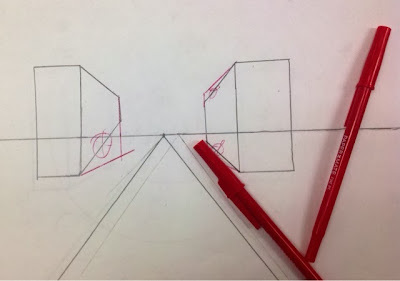 My perspective drawing instructor at CCAD loved the red pen of death. We always had to mount our work on board, then wrap it in acetate. That acetate sometimes came back more red than not for certain students in the class.